HorseRacingFLA’s recommended bets on Saturday’s $9 million Pegasus World Cup Invitational (Grade 1) produced a profit of 31.5 percent, due mainly to our hitting the exacta. Meanwhile our editor Jim Freer, handicapper Bob Bauer and business manager/photographer Barry Unterbrink all correctly picked City of Light to win the Pegasus at 1 1/8 miles on dirt at Gulfstream Park. We recommended a total of $48 in bets. Those bets produced a payout of $63.10–for a $15.10 profit that translates to a 31.5 percent return on investment. We had $5 to Win and $5 to Show on City of Light. who paid $5.80 to Win and $3.00 to show on $2 bets. Our two $5 bets generated a return of $22.00. City of Light, at 9-5, finished 5 3/4 lengths ahead of runner-up Seeking the Soul, who went off at 34-1 odds. Our wagers included a $1 exacta box on City of Light (3). Seeking the Soul (4). Accelerate (5) and Gunnevera (8). The City of Light-Seeking the Soul exacta paid $41.10 for the $1 bet. We also had an exacta part-wheel and two trifecta bets that did not win. We lost on those bets because we did not have Seeking the Soul in the second spot. We will continue with our recommended bets on major races this coming Saturday, Feb. 2, with the Holy Bull (Grade 2) at Gulfsteam. It is 1 1/16 miles on dirt for 3-year-olds and is points scoring race for qualifying for the Kentucky Derby, to be run May 4 at Churchill Downs in Louisville, Ky. Here are the post positions for the $9 million Pegasus World Cup Invitational (Grade 1) to be run this Saturday Jan. 26 at Gulfstream Park in Hallandale Beach, Fla. Scheduled post time is 5:40 p.m. Eastern. The race is 1 1/8 miles on dirt for 4-year-olds and up. The following list has the names of trainers and jockeys, along with morning line odds. 1/21/2019 -The post position draw will be held at 11:30 a.m. Eastern on Tuesday for Saturday’s running of the $9 million Pegasus World Cup Invitational (Grade 1) at Gulfstream Park. This will be the third running of the Pegasus, the world’s richest horse race. It is 1-1/8 miles on dirt for 4-year-olds and up. Gulfstream will have twelve races on its Saturday card, with first post of 11:30 a.m. Eastern The Pegasus is the 12th race with scheduled post at 5:30 p.m. Eastern. On Tuesday afternoon, Gulfstream also will put out entries and post positions for Saturday’s other eleven races. That will include the first running of the $7 million Pegasus World Cup Turf Invitational (Grade 1), at 1-1/8 miles for 4-year-olds and up. Seven of the day’s other ten races are stakes. HorseRacingFLA will have coverage of the draw and other Pegasus news on Tuesday afternoon. We will be at Gulfstream on Saturday for coverage with photos and stories. It is almost certain that the on-dirt Pegasus will have a full field of twelve entrants. The likely entrants are Accelerate, Audible, Bravazo, City of Light, Gunnevera, Imperative, Kukulkan, Patternrecognition, Seeking the Soul, Something Awesome, Tom’s D’etat and True Timber. We will have profiles of top contenders beginning Tuesday afternoon. 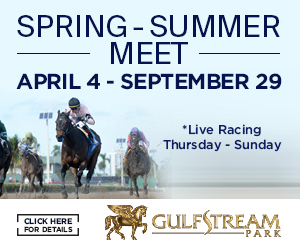 Details can be found on the Gulfstream Web site. Purchases can be made online, or on Saturday at the track. Parking is $30 in advance and $20 on Saturday. *The NBC over-the-air network will have live Pegasus coverage between 4:30 p.m. and 6:00 p.m. Eastern on Saturday. *Tampa Bay Downs will have coverage of the Pegasus and all other Gulfstream races on Saturday. So will most other Florida pari-mutuels. Call or visit their Web sites to find out.